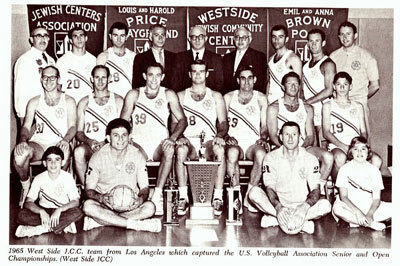 L.A.'s Westside JCC teams won the United States Volleyball Association's Men's Open Championships in 1960, 1965 and 1968. In 1965, Westside also captured the USVBA's Senior Open title. Players on these teams included: Gene Selznick, Harlan Cohen, Mike Bright, Ronnie Lang, Larry Rundle, Rudy Suwara and Leonard Reifman. Team managers were Sol Marshall and Eli Sherman.